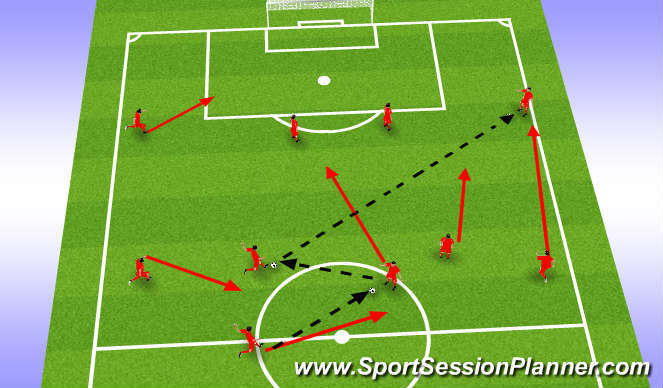 This is a session the encourages passing and movement, also we are looking at movement that can cause us to play between the lines (breaking the lines)session starts with centre defender playing pass out to full back and moving at angle to receive ball back. As the centre defender now move to receive the ball our midfield move to support and be an option to receive a pass so we can look to attack. centre mid receives ball on half turn so he can see passer and majority of play in front of him so he can make better decisions quickly. from this midfielder 2 creates Angle to get pass. 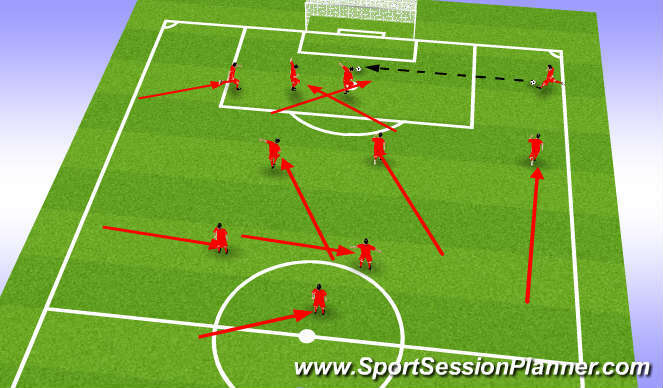 now midfield 2 has ball he can see the attacking half and is passing the ball out to winger. 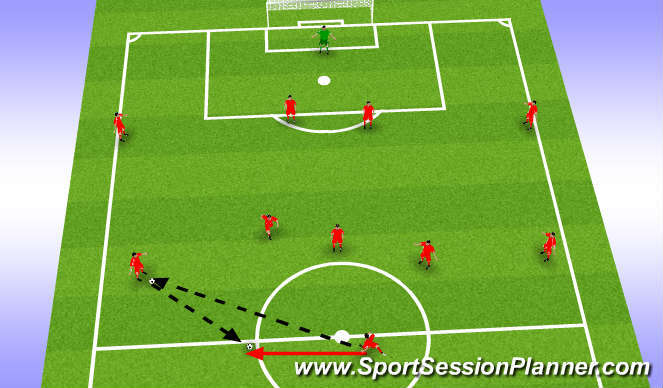 Now players see where ball has gone and move to either support player on ball, take up space created by other team mates movement or cover central part of the pitch in case possession is lost. now winger has the ball - part 1 is to receive ball and attack the line to get cross in. from this our strikers are making movement to lose defenders, one looks to attack near post and one looks to attack inside back post (also remembering that man who attacks back post is at an angle and distance slight behind striker who runs to front post. the winger on the opposite side moves towards the inside of the penalty area to create a 3 striker and can attack any cross that is over hit. 2 of the 3 midfielders attack the edge of the 18 yard box, for any pull backs or clearances that land in these areas. Right full back supports crosser in case he cant get ball in to 18 yard box. left back 1 midfielder and central defender cover central part of the pitch by the half way line in case attack breaks down and can hold up attack until cover has happened. 1 - attack opposite side.